Sony Announces Gaudy Go!Cam For The PSP | OhGizmo! 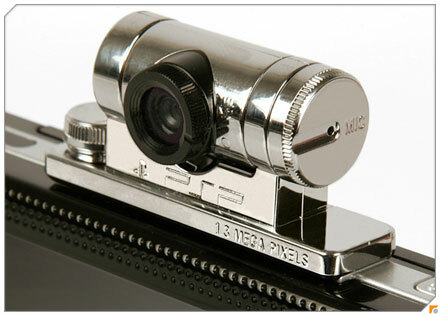 The recently announced Go!Cam is a 1.3 MP camera that hooks up to your PSP. With a 4GB Memory Stick PRO Duo it can record up to 2.5 hours of video, or take up to 40,000 photos. It swivels 180 degrees so you can take pictures/video with the PSP facing either way. The real question however, is why on earth Sony went with the chrome: it doesn’t match the PSP’s black, and makes it look like a pimp-ish parasitic cyborg took control of your PSPs brains. Of course, what do we really know about color arrangements? Perhaps chrome is the new black. We do know that the Go!Cam will retail for â‚¬50 (~$68), and hit European regions (PAL) on May 16. Only serious problem with this is that you need to be running Firmware 2.80 onwards, making it a choice between your beloved homebrew… and this chrometastic monstrosity. Homebrew is on 3.40 now. You can also upload you video directly to youtube from any hotspot.